Unlike most Sheriff’s Office in the state of Georgia, The Newton County Sheriff’s Office is a full service Sheriff's Office dedicated and committed to enforcing the laws enacted for the Protection of the Lives', Person's, Property, Health, and Morals of all citizens in Newton County. Our goal is to be recognized as a professional organization that values, respects, and honors the rights and dignity of each person we are called upon to serve. Through collaborative efforts, we are committed to improving the quality of life in our community. With so many unique careers under one agency, you'll have the chance to experience a wide range of law enforcement activities and choose the one that's right for you. I want to extend my personal invitation to you to take part in the Newton County Sheriff’s Office mission as an active Explorer. Come join a great program that offers you the chance to work in an exciting environment and enjoy exceptional educational benefits. The Explorer Program offers opportunities in character building, good citizenship, and fitness for young men and women ages 14 through 21. Giving the community the opportunity to interact with the explorers by sharing common interest. 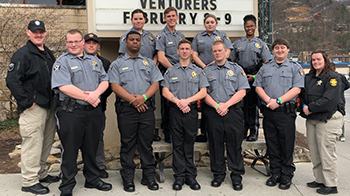 Involving young people in activities that help increase the effectiveness of Newton County’s own personnel and help accomplish Sheriff Brown’s mission. For more information on how to join, please contact Deputy Patrick Gilbert at pgilbert@newtonsheriffga.org.